Middle cerebral artery (MCA) aneurysms are fairly peripheral to the arterial tree, occurring close to the cranial surface. They are often broad based and rarely lead to a hematoma in the temporal lobe or Sylvian fissure. (Compare also Sect. 7.2.) 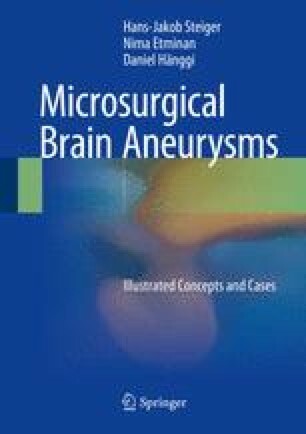 These factors are in favor of the microsurgical approach, although many MCA aneurysms can technically also be controlled with modern endovascular systems. The location and projection of the aneurysms is important for approach planning. As outlined earlier, we prefer a tailored transsylvian approach in which the M2 segments are identified first and then followed backward to the bifurcation and the neck of the aneurysm.